Rhubarb is one of the first food plants to be ready for harvest and comes into season in mid- to late spring (April/May in the northern hemisphere). 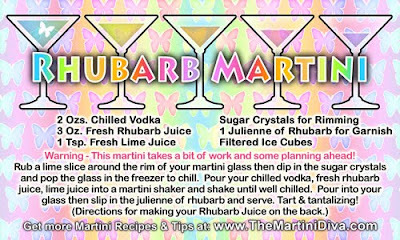 You're going to start seeing some nice fresh stalks in your market soon so grab or make some Fresh Rhubarb Juice and prepare for some great Fresh Rhubarb Martinis! INTERESTING LITTLE RHUBARB FACT: Here in the States we think of Rhubarb as a fruit but it is really a vegetable! Thanks to a decision by a New York court in 1947 it was designated as a fruit in the United States for the purposes of regulations and duties, a decision that also reduced in taxes paid!